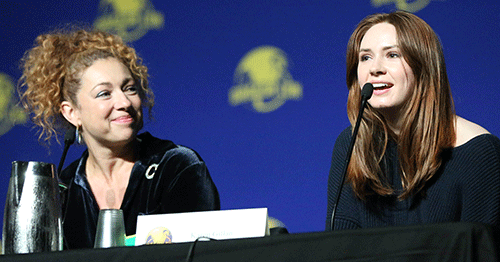 Karen Gillan and Alex Kingston entered a packed Marriott Atrium Ballroom Sunday afternoon to thunderous applause. Arthur Darvill was unable to make the panel due to his flight schedule, but the two women continued without him. They kicked off the panel by asking anyone with a sonic screwdriver to raise it in the air for a salute. Deciding to mix things up, before audience members were able to ask the guests questions, they first had to answer (or attempt to answer!) a question or request from the guests. Kingston and Gillan started things off easy, asking an audience member what TARDIS stood for. Things progressed and got tougher, including asking audience members to mimic the sound the TARDIS makes and having them sing the Doctor Who theme song. Each person who answered the question correctly (or performed the required task) was awarded a prize—a banana. The last banana was given out competition style, with two audience members brought up on stage and asked to perform tasks with the audience judging the winner. The tasks included doing their best River Song impressions with her catchphrases “Hello, Sweetie” and “Spoilers!” The final task was that each of them had to come up with their own Amy Pond impression. One contestant chose “I once dreamt of a raggedy man….” whereas the other chose “Doctor, what’s the plan?” The winner was someone wearing a light-up TARDIS balloon on his head and was chosen by overwhelming audience applause. The moderator got things started, asking where Amy would take River on a “mother-daughter day.” This led to an elaborate discussion about a spa day somewhere in space, to give them fancy nails that could turn into “Wolverine claws” if they needed protection, or a many-tentacled creature that could give a good massage. After a question about getting started in acting, Gillan explained that she came to it because she watched too many horror movies as a child, when she absolutely shouldn’t have been. Kingston kept thinking she wanted other jobs, but came to realize it wasn’t about the job. It was about the outfits that come with the jobs, so she decided that acting allowed her to try on the clothes without having to commit to a career. Gillan was asked how she felt when she discovered that Kingston’s River was in fact Amy’s daughter. “Complete shock,” was her immediate response. Kingston had been informed of that plot twist well in advance because she was not under a full contract. Steven Moffatt had to make sure that she would be available to film, and she then had to spend a good while keeping mum, perhaps why River’s “spoilers!” has such a convincing delivery. Other audience questions included favorites such as “What’s your favorite episode of Doctor Who?” Gillan chose “The Girl Who Waited,” because it was the episode that established her character, while Kingston went with two episodes—“Silence in the Library” and “The Husbands of River Song,” which book-end her appearances (so far) on Doctor Who. Both panelists talked about their experiences behind the scenes in the UK versus in the US. They compared the food (which is apparently abysmal in the UK) and the trailers. Kingston talked about her trailer being an old 1970s caravan where even the lights didn’t work. The moderator compared it to being managed by Charles Dickens on the UK side. Despite the less than glamorous behind-the-scenes experiences, both panelists said they’d gladly endure them to be on Doctor Who because it’s more than worth it. The panel wrapped up with both women leading the audience in a sing-along of the Doctor Who theme.